Thank you, Sir Emyr Jones Parry, for that kind introduction. I’m grateful for the invitation to be here on the eve of the NATO Summit. We’ve been preparing for it for a long time, so it’s great to finally be here in Wales. The formal agenda for the summit, which you have been discussing here today, has changed little since the Summit was announced last year. But the strategic context couldn’t be more different, and the stakes couldn’t be higher. Yes, we will still be discussing Afghanistan, defense capabilities, partnerships, and the Transatlantic bond, as originally planned. But our Heads of State and Government will gather on Thursday and Friday at a time of unprecedented turmoil on the European continent and beyond. Compared to a year ago, no one is asking whether this 65-year-old Alliance is still needed to ensure our security. But people are asking whether NATO is up to today’s challenges and whether it has the means – and the political will – to meet them. The main reason, of course, is Russia’s ongoing aggression against Ukraine, which has called into question many of our assumptions about the post-Cold War order. Russia’s actions – attempting to alter legally recognized borders by force and actively subverting the government of a neighboring state – pose a real threat to an open, rules-based international system, a system based on respect for the sovereignty and territorial integrity of all states and their right to make their own choices without fear of intimidation or interference. Russia’s actions leave us no alternative but to make some fundamental choices of our own. This is not where we would like to be in our relations with Moscow. It’s important to remember that, for more than 20 years, NATO has viewed and treated Russia as a partner with whom we share a range of common interests. Indeed, at the last NATO Summit held in the UK, in London in 1990, we began an extraordinary journey in which we reached out to former adversaries with the aim of building a pan-European security system that benefits everyone. Our vision of a “Europe whole, free and at peace” explicitly included a prominent place for a democratic Russia. And, until very recently, Russia said it shared the same vision. In 1997, we signed the NATO-Russia Founding Act on Mutual Relations, where we stated that neither saw the other as an enemy and where we cemented our common commitment to creating a “lasting and inclusive” peace. We worked together to counter terrorism and piracy, to strengthen stability in Afghanistan, and to tackle many other problems where we have a clear, common interest. Our troops deployed together for several years under the NATO flag to keep the peace in Bosnia and Kosovo. And when the new democracies of Central and Eastern Europe sought to join the Alliance, we made a special effort to show that NATO enlargement would contribute to stability and that it was not directed against Russia. This included a series of unilateral commitments to refrain from deploying substantial combat forces or nuclear weapons in new member states. After the terrorist attacks of 9/11 shook the world, NATO-Russia cooperation became even closer, as we joined forces against a common enemy, and as Russia joined Allies at the table as an equal member of the NATO-Russia Council. Indeed, at the Lisbon Summit four years ago, NATO and Russia set the goal of a true strategic partnership that would encompass previously contentious areas like missile defense cooperation. We worked hard to treat Russia as a special partner and build that strategic partnership, yet Russia lost interest when Vladimir Putin regained the Presidency in 2011. Russia threw up excuse after excuse to avoid serious work on missile defense, and became less and less willing to engage on arms control, defense transparency, and most other issues. In the wake of NATO’s operation in Libya in 2011, Russian leaders took an increasingly competitive, zero-sum approach to international security, backed by militant, anti-Western rhetoric in which NATO became public enemy number 1. But this shift in Moscow’s policy was more about Russian domestic politics than geopolitics: the Kremlin falsely blamed the West for the domestic opposition to the increasingly authoritarian system it had put in place, highlighted by the protests over President Putin’s reelection in 2011. Indeed, President Putin became convinced that the West was determined not only to weaken Russia but to topple his regime. Geopolitics and domestic politics came together in Ukraine. Putin’s pressure on Viktor Yanukovych to reject Ukraine’s Association Agreement with the EU backfired, provoking the Euro-Maidan rebellion, the flight of Yanukovych to Russia, and Moscow’s aggressive response, which has now caused the worst security crisis in Europe since the end of the Cold War. There are many views on what prompted Putin to undertake armed aggression against a “fraternal” neighboring state. While blocking Ukraine’s path to the EU and NATO was a factor in Russian decision-making, I believe it was fundamentally about Russian domestic politics. Put simply, to acquiesce in the popular ousting of Russia’s preferred leader and the successful establishment of a democratic, Western-oriented regime in Kyiv would be an existential threat to the political system Putin has built in Russia (and therefore to Putin himself). That is why Russia has spurned every offer to “deescalate” the crisis thus far. In recent months, we have seen Russia violate multiple agreements and many of the basic principles of international relations. Russia sought to annex part of a democratic, sovereign nation state and continues to destabilize the rest of the country. Until recently, it has done so by proxy and with a degree of ambiguity and deniability, using its “little green men” and an aggressive disinformation campaign, all backed by a heavily armed invasion force poised on Ukraine’s border masquerading as ‘peacekeepers.’ Now, there is mounting evidence that it is now directly participating in the conflict. Even the Russian people are finding Moscow’s denials as more and more implausible. What Russia has been doing is sometimes called hybrid warfare, or non-linear warfare, or ambiguous warfare. But whatever you call it, it is warfare, plain and simple. And the casualties are mounting: among the Ukrainian military, but also increasing numbers of civilians, as well as those lost in the downing of the Malaysian airliner – a tragedy that bore the fingerprints of the separatists using missiles provided by Russia. And in waging an undeclared war in Ukraine, President Putin has torn up the international rule book and undone the good work both Russia and the NATO Allies have achieved since the fall of the Berlin Wall. Russia has returned to the politics of a previous time – not to Soviet-era, Cold War politics so much as to the politics of spheres of influence and to ethnic-nationalist doctrines of centuries past. The doctrine enunciated by President Putin in March, moreover, has no clear limit. In claiming the right to use force to protect Russians living outside of Russia, Russian-speakers, and historically Russian territories, Russia has forced us to reckon with the possibility that Russia could undertake hybrid warfare against parts of NATO itself. So the question for NATO is: What is our strategy towards Russia? And what are we prepared to do to achieve it? We certainly don’t want a new Cold War. No, our long-term objective must be to encourage Russia to choose a path of cooperation and responsible behavior; to be a country that works within the international community to solve common problems. But to do so it must come back into compliance with the rules and it must respect the sovereignty of other nations, including their right to choose their own destiny – even if Russia disagrees with those choices. Until such a time – and I think we’re quite some years away – Russia must know that it is isolated, and that the world stands against its reckless actions in Ukraine – as demonstrated by its expulsion from the G8, the clear rebuke at the UN General Assembly to its Crimea land-grab, and the accumulating sanctions that are squeezing its economy. One must wonder how long Putin can ride the populist wave as his cronies, and Russian society, begin to experience the very real consequences of his adventurism and as Russia’s international political and economic stock continues to decline. For NATO’s part, we will do whatever is needed to defend our Allies. At this week’s Summit, we will adopt a Readiness Action Plan to reinforce our ability to deal with any threat. As part of the RAP, we will launch plans to increase the readiness of the NATO Response Force, so it has the capacity to respond in days rather than weeks to a threat of aggression. We will lay out a plan for the forward presence of command and control and key enablers so that we have the capability to rapidly reinforce our eastern flank, together with plans to regularly exercise that capability. We will work with Allies, as well as other like-minded organizations, to develop a range of measures, political as well as military, to deal with hybrid attacks. We are also reviewing our defense plans, threat assessments, intelligence-sharing arrangements and early-warning procedures. All these measures will not only reassure NATO members, but bolster deterrence in the face of the new strategic challenge posed by Russia. We must also reverse the decline in defense spending that began after the fall of the Berlin Wall and accelerated during the financial crisis. Over the past five years, total defense spending by NATO nations has fallen by 20%, while Russia’s defense spending has increased by 50%. 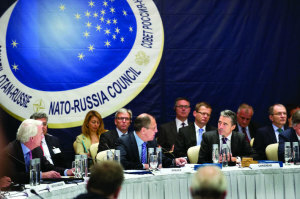 To the Kremlin, which measures its global standing in military might, NATO appears weak. And it sees an opportunity to act. Our job now is to correct that perception – to be united in word and deed, and to increase spending on defense. At the Summit, I expect that Allies will pledge to halt the slide, and move toward the 2% of GDP guideline for defense spending as their economies improve. And I expect they will, just as importantly, pledge to spend more of their money on the right things – deployable forces, well trained and equipped with modern equipment – so that we get the most bang for our collective buck. When it comes to deterrence, it’s not enough for us just to say it. We have to mean it. And President Putin – and potential adversaries elsewhere – have to believe it. Let me add that, while Russia is clearly at the front of our minds, we are not focusing solely on Russia. Chaos and instability have spread around our borders – in the Middle East, North Africa and the Sahel. Terrorism, proliferation, cyber attacks and other transnational threats challenge our stability in Europe, as well as across the globe. Just four years ago, at the Lisbon Summit, NATO defined its core tasks as collective defense, crisis management and cooperative security, working with partners around the world to reduce instability . But now, many have argued that we should go “back to basics” and concentrate on collective defense. I disagree. Clearly, collective defense in the face of a resurgent and revanchist Russia is paramount. But in today’s world, NATO needs to be a strong multi-tasker and a consummate networker – because we are stronger when we are joined by our partners and when our partners are strong. By making sure that our militaries are compatible, we can be far more effective when we need to deploy together. And by building the capacity of our partners’ armed forces, we make it easier for them to maintain stability in their own regions without the need for direct NATO military involvement. There is no doubt that the security landscape here in Europe changed this year, and not for the better. How it will look in a year or two is impossible to predict. But I can confidently predict that whatever the future does hold, NATO will be prepared. From its early days, NATO has had to bend and flex to meet any challenge, from any foe: from the military might of the Soviet Union to the Taliban in the deserts of Afghanistan, from bringing stability to the Balkans to preventing piracy off the Horn of Africa, the strength of NATO has always been its endless ability to adapt, and to rise to each new challenge that comes along. I am confident that this week’s Summit, here in Wales, will be no exception.